It’s no big surprise that I meet people all of the time, and recently I made the acquaintance of two awesome young ladies, Andrea and Jenna, who work for Ford Model Management (see my post on the P&G Beauty awards to check out their pics) anyway, Andrea and Jenna were so great that night. We chatted before the ceremony started and Jenna let me know that she runs the artist division at the Toronto office. Naturally, I gave her a confused look, who knew that Ford a name synonymous with beautiful models represented artists! I’m sure Jenna didn’t see the drool slowly escaping from the corner of my up turned lips. Chasing girls, which is kind of unusual in my work. I started because I was in art school and I had a lot of friends who were in the fashion industry, but none of them could draw, so they would come to me and be like “Evgeny, can you draw this design for me, can you sketch this out” so I would. 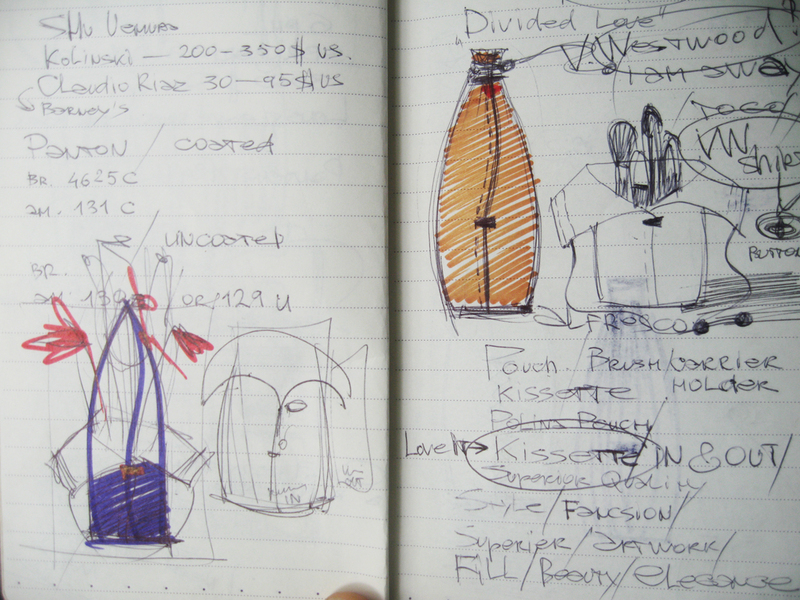 In the process of sketching the clothing for them I would also design the hair and the make-up of girls in the sketches. I would go to their fashion shows and be back stage giving out my sketches to the hair stylists and the make-up artists. But, then I would watch what the make-up artist was doing and I would say “No, add this colour here.” or “I think this line should be more like this – well let me show you.” I would take the brush and make the changes so it looked more like the sketches I had drawn. My friends were like “Evgeny are you a make-up artist?” and I would always say no. But because of art school it was an easy transition for me and well being young and spending all my time around beautiful girls, I said why not, at that age what more can you ask for? Who is your make-up Icon? Serge Lutens, he was a make-up artist for Christian Dior in the late ‘70’s and it was the first time I thought of the idea that you can transform a person’s face in a picture into an art form. Name a beauty product that you can’t live without? Mascara, because you can fake the rest, but the eye is the mirror. Without mascara it’s not done. Which tool is your favourite? Favourite make-up trends for this season? I don’t follow trends because I don’t want to be stuck in one season or have to make a transformation from season to season. I like what I like, I like the bold look meaning a very structerd and complete look, not necessarily bold colours. I like that my clients tell me they can recognize my work. 5 things every woman should do to create the perfect face? Concealer or skin corrector to clean up the magic triangle area that includes eyes, nose, eyebrows, in yellow or orange, but not green it doesn’t work. Lip gloss that you put on the crease of the eye which is the same colour you have on your lips, smudge it a little bit it looks not totally fresh but gives you a good look. Vivienne Westwood, she has a charisma, you can wear her things in 20 years from now and it will still be cool. I also like her for the cut of her clothes. Where do you derive your inspiration from when you’re preparing for a shoot (given free reign), where would that come from? With my commercial clients, I try not to have them tell me that I can do whatever I want. I always ask for direction, like a picture, because my vision of beauty is not the same as another person’s vision of beauty. 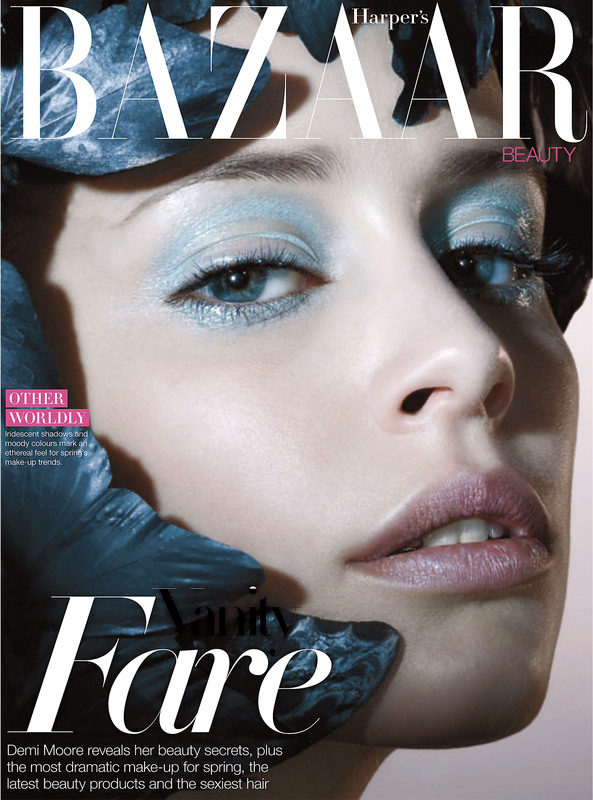 With my private clients I use their face and my vision of beauty to create the look. The ideal make up job? After having my brush line I would love to have a great makeup line, where I could work with the colours and work with the pigments and develop the product. Where I could explain to the average woman how she can create a beautiful face with a simple product and simple tools. I don’t want to work with a company and say that something is a great product when I know that it’s not. I’m trying to be more concious of the make-up companies I deal with. 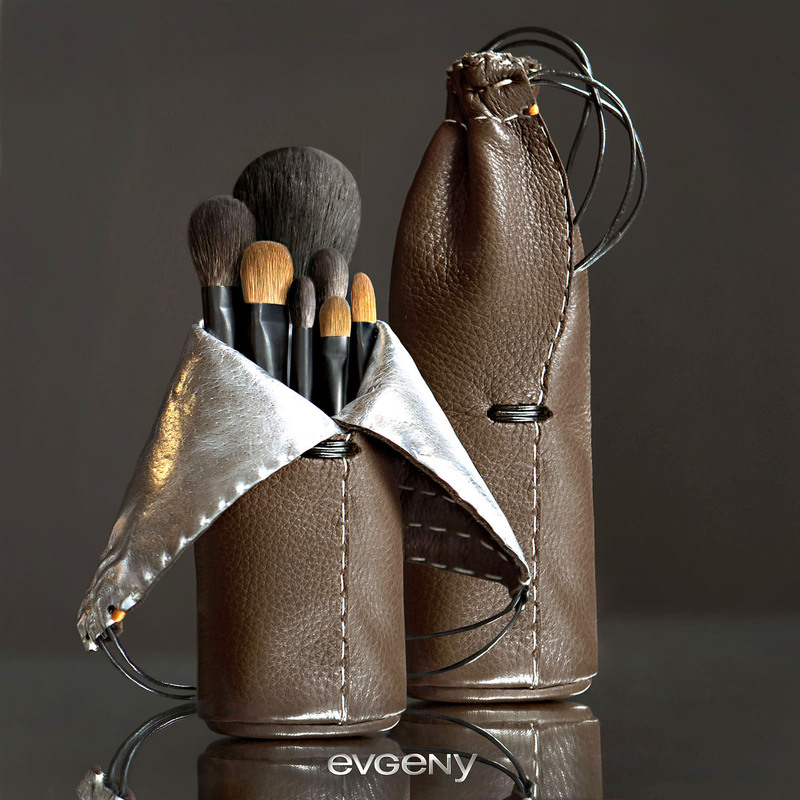 How did Evgeny Cosmetics start? I started with brushes because it seemed like the simplest way and easiest way to start. I had a client tell me a long time ago that when I was ready that she had the manufacturing contacts that I would need to get started, so I went and met with her. I had been thinking about doing my own thing for a while and it happened at a point when I was ready. It took me a while to finish the brushes because I wanted to find the right quality product. For example, the Blue Squirrel that I use in my brushes; it had to be real. A lot of people would say (in their brushes) that it’s Blue Squirrel that’s in the bristle, but it’s not. I didn’t want that. So, I waited until I found a farm in the Yukon. I went there to see the hair, and the process of removing it. The hair grows long and soft because it’s cold year round, it’s not really blue, it’s black but when the light hits it, there is a blue tinge to it. This is where it gets its name. All the brushes are hand shaped so it takes a while to make them. Where can people purchase your brushes? 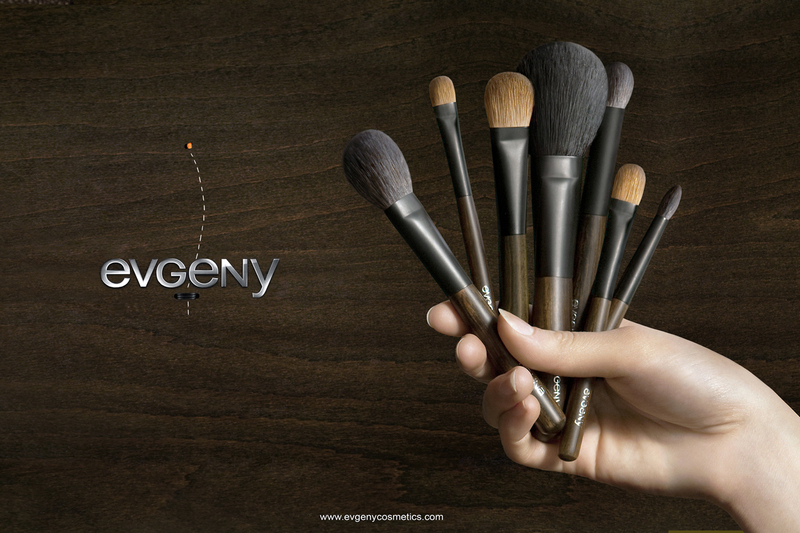 On the website http://www.evgenycosmetics.com and two locations in Yorkville sell the brushes as well. 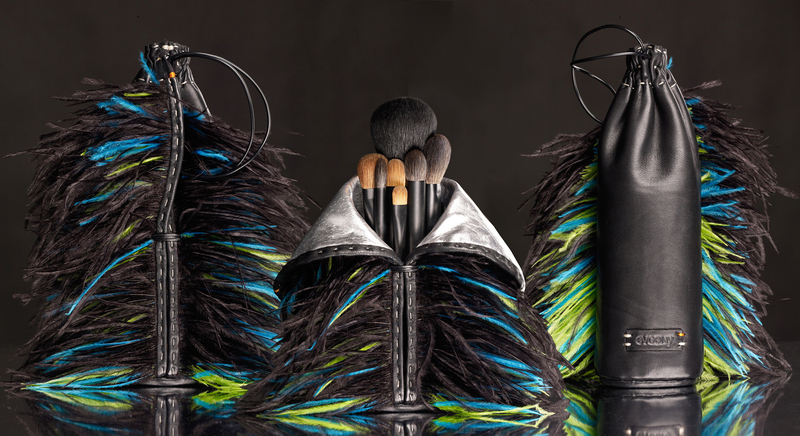 All aspects of Evgeny’s brushes are made by hand. 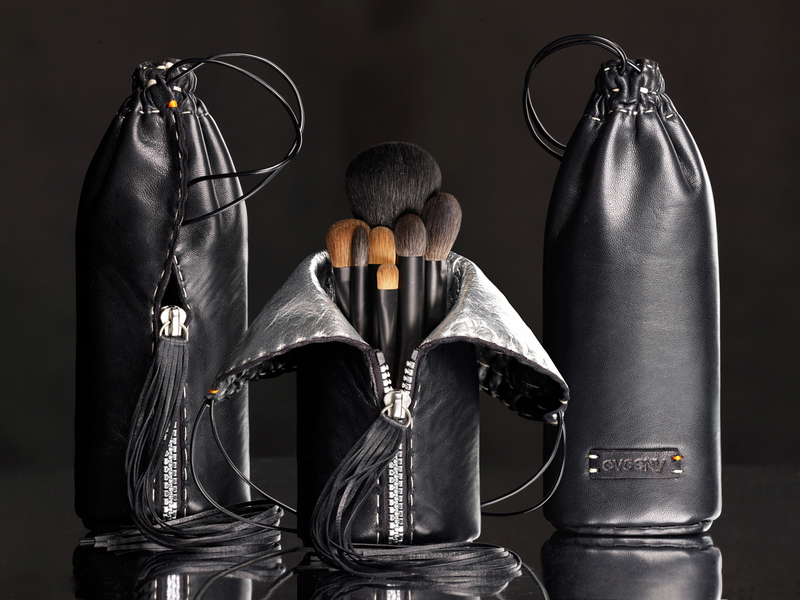 Even the chic brush pouches are hand made, how’s that for quality. Believe me when I tell you that his brushes are an MUA’s dream come true, well worth the investment. A funny or interesting experience you’ve had while working? A few months ago I had a client during the film festival and when I arrived at the hotel to do her make-up she says to me “Oh, you’re here, great! Before we start can I ask you a favour, can you use my brushes?” Now, I like to use my brushes because I figure if I use them and my clients like them, they might purchase them. They can see how the brushes work, and a lot of the time clients fall in love and they want them for themselves. So, this client is holding the brushes and going on and on about how much she loves them. She tells me that she got them as a gift a little while ago and that since then every time she travels she takes them with her. She then says “But, I have no idea who makes them. Who’s Evgeny?” I say “I am Evgeny” She was very surprised and shocked when she discovered who I was. The funny thing is the whole time she was talking about the brushes neither of us realized that she was talking about my brushes. I personally thought this was an awesome story! 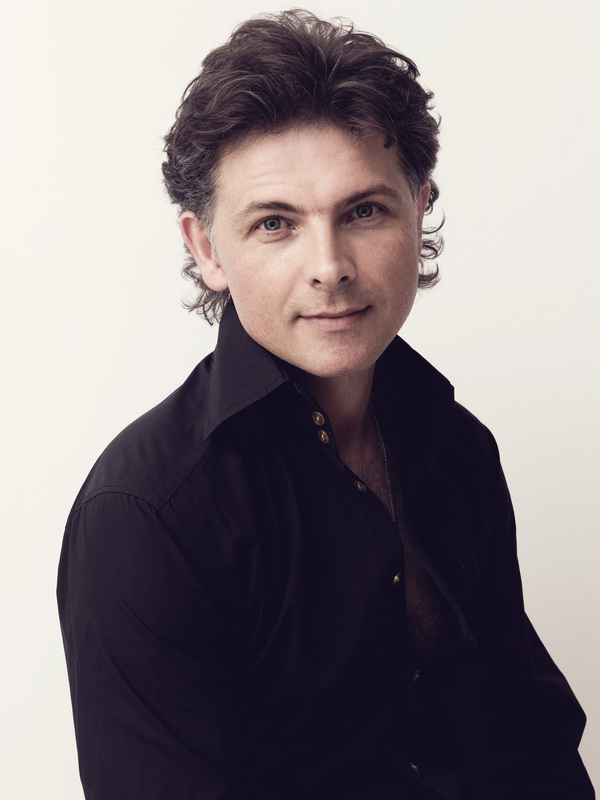 So that concludes this post on Evgeny, I hope you liked reading it as much as I enjoyed presenting it to you. For booking information contact Ford Model Mangement. 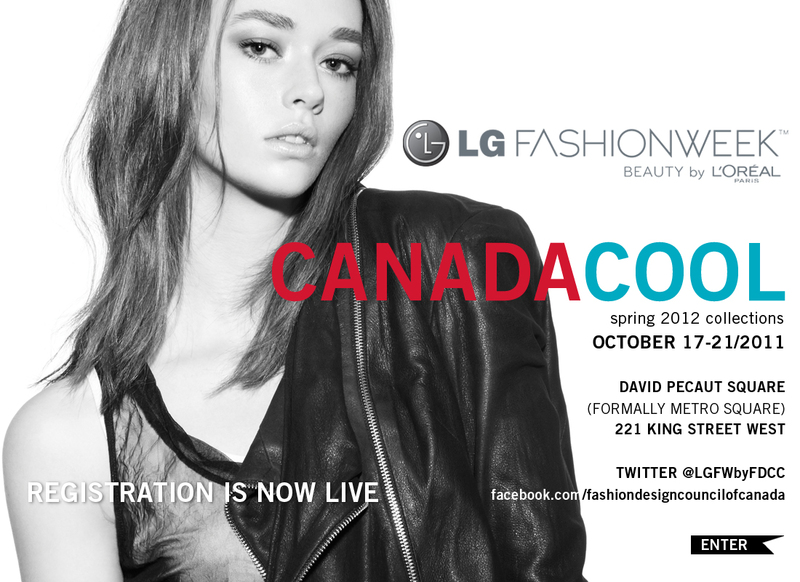 Also, to purchase his brushes or learn more about him visit his website www.evgenycosmetics.com. Since I started this blog in April I have steadily been building up each section of the blog so that I can cover all the areas of the fashion life that I so love. With the addition of the final two categories I’m now covering everything I want to cover in each of my posts. Here is a breakdown of the last two sections and what they are going to be about. So primarily a blog is a writer’s opinion on a particular subject, in a lot of cases the subject is themselves. I wasn’t too keen on that idea I wanted to talk about the people who are fully engaged in making the fashion industry progress, I wanted to hear their stories and tell their stories to you, my readers. However, it seems yall wanna know what I’m up to too so this is the section that covers what I’m doing. You are not going to find posts in this section every week or even every month but I will let you know what I’m up to from time to time. My blog as I keep going on and on about is focused on the behind the scenes magic makers; but I figured that I would on occasion feature an interview about a person who isn’t behind the scenes, like a designer, or a photographer, a model etc…Like the What’s Alexxuss Doing section I won’t post here every week or even every month but I will certainly be catching up with some of these more exposed individuals, interviewing them and sharing their stories with you. I appreciate every person who’s clicked a link and read a story about someone I’ve interviewed believe me the interviewees appreciate it too. I will be catching up with some of the them before the year ends so stay tuned for updates.